When my husband and I were first married, we got a few gift cards that we wanted to put to good use- particularly with kitchen supplies. He loved to cook and I was learning;). One thing my husband insisted on getting was a salad spinner. My naïve newlywed self didn't even know what it was and thought it was the lamest idea ever. My mom had always just wrapped the lettuce in dishtowels and I thought that dried the lettuce well enough. Plus, if I used the salad spinner, it would mean one more dish to wash… I would do anything to avoid dirtying another dish- especially because we didn't have a dishwasher! -Dry anything! Who says lettuce is the only thing that needs to be rinsed? What about berries, broccoli, leeks or anything else that you wash and ends up dripping wet? Just give it a gentle little spin to remove the excess water. -Rinse fruits/veggies. 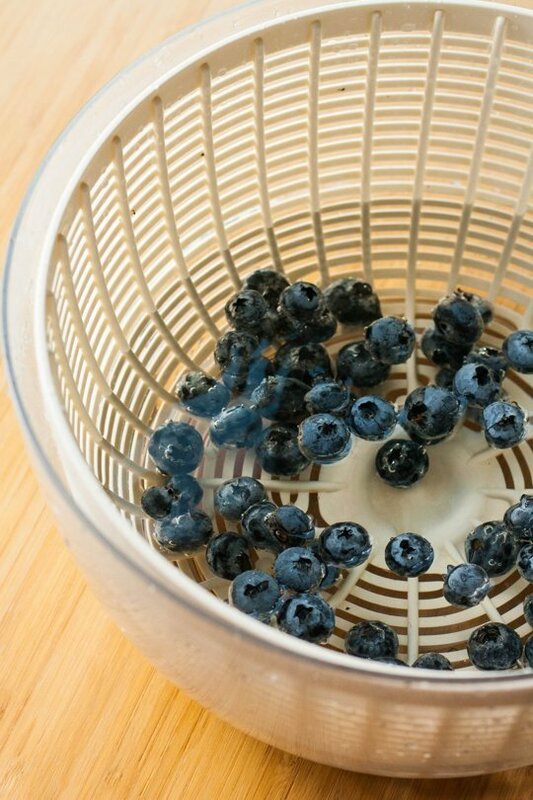 This especially works great for those more fragile foods, such as broccoli or raspberries. Just throw them in the spinner part and you can gently rinse them without squishing, shredding or breaking them. - Drain pasta or beans. 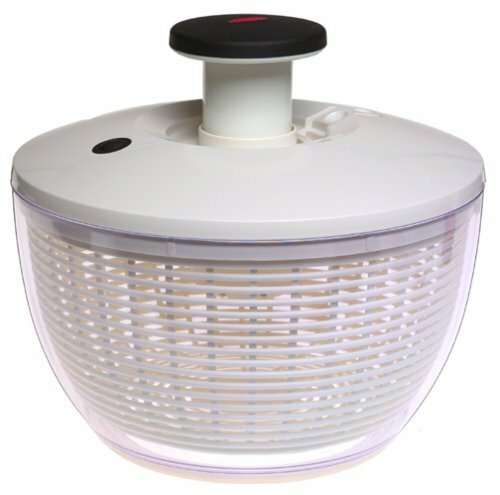 The insert of a salad spinner can double as a colander, so it's great for rinsing/washing beans or pasta. -Spin the excess moisture out of potato/zucchini peelings. When making hashbrowns or zucchini bread, you want the gratings to be as dry as possible. You definitely will probably still need to squeeze some water out, but save your hands some of the trouble by giving it a good spin first. -Proofing bread. Place the bread on the counter and place the bowl of your salad spinner over the bread (this only works if you have a clear salad spinner bowl). You can keep an eye on your bread and keep it from drying out at the same time. -Cover your cakes and other desserts. Who says you need a fancy glass cover when you have a salad spinner bowl that will accomplish the same thing? Genius. -Wash delicates. 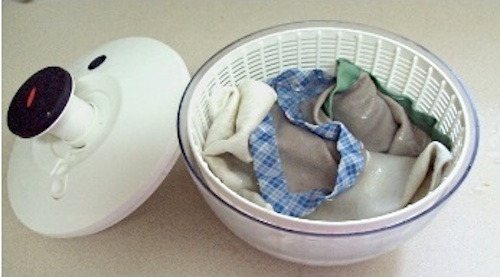 If you have a few items of clothing that need a little extra tlc, you can use the salad spinner to give them a more careful wash.
-Use the bowl as a serving dish. If you are short on big bowls to serve food in (as I often am), the bowl to the salad spinner works great! It's especially handy if you have a clear bowl, and if you are serving foods you might want to show off, like trifle. Hopefully you have a few new ideas to implement with your salad spinners! Do you have any other unique ways to use it? I would love to hear! Share your thoughts in the comments below.